A dental implant is the ideal replacement for a missing tooth. It’s the closest alternative to your own healthy natural tooth. A dental implant is an artificial tooth root that is gently placed in the space left from a missing tooth. A custom crown is made and attached to the implant. If properly completed, it looks and feels like the natural tooth it is replacing. If you are missing all of your upper or lower teeth, two or more dental implants can be used to support and stabilize a denture. The stability of your denture increases with the number of implants you receive. 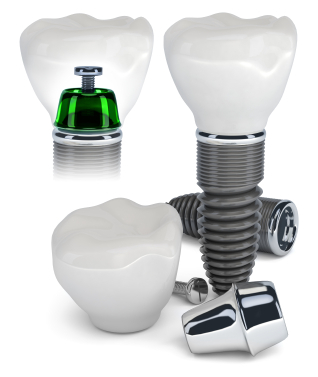 Dental implant root fixture – A screw-shaped implant fixture, made of titanium, is placed in your jawbone. Abutment – If a single tooth is being replaced, a connector is placed on top of the implant. It will support a dental crown. Dental crown – For a single tooth, a customized crown that matches the color and characteristics of your natural teeth is attached to the abutment. Denture – If an arch of teeth is being replaced, your denture will be attached to two or more dental implants. Evaluation and treatment plan – Most people can be candidates for dental implants, but your medical and dental histories will be reviewed to ensure you can receive this treatment. You will receive an oral examination. 3-D x-ray images will be taken to determine if you have adequate jawbone to support dental implants or if grafting is needed. Your treatment options will be explained, and after you choose an option, you’ll receive a treatment plan. Precise implant placement – An oral surgeon will perform minimally invasive, computer-guided implant surgery. Healing – As you heal over a period of three to four months, a process called osseointegration occurs. Your jawbone and the implant will fuse together to provide a stable anchor for your replacement tooth. Abutment placement – The connector is attached to the dental implant. It will support a natural-looking crown. Crown or denture placement – A customized crown will be made and attached to the abutment. It will look natural and blend with the surrounding teeth. 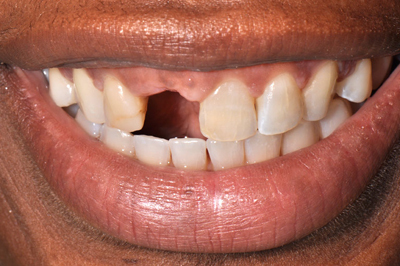 If an arch of teeth is being replaced, your denture will be secured to the implants. 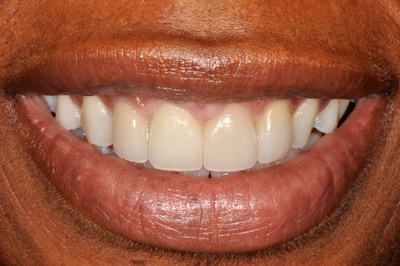 Conservative: To place a bridge, the teeth adjacent to the missing one have to be reshaped and covered with a crown. This considerable reduction in tooth structure is avoided with an implant. Your healthy teeth will be untouched, which can have significant long-term benefit for your oral health. Comfortable: An implant is more comfortable than a dental bridge. It functions and feels like your own tooth, so you won’t have to worry about food particles getting trapped beneath it. Reliable: Dental implants have become highly predictable. If you take good care of them, they will last for many years, maybe your lifetime. Throughout the healing period, you will have periodic follow-up visits to ensure the implant site is healthy. Your dental implant will look and feel like a natural tooth. Like natural teeth, dental implants need daily care. Brush your teeth twice daily and floss daily to keep your teeth and your dental implant clean and free from plaque. The photos below are an example of the natural-looking results you can expect with dental implants. Dr. Weiss beautifully restored this patient’s smile. It will be easier to speak with dentures that are stabilized with implants, and eating will be more enjoyable. Your dentures will be stable and feel more like your own natural teeth. Thoroughly clean your implant overdentures daily. If you’re missing one or more teeth and would like to know your options for dental implants, call us or complete our Request an Appointment form to schedule an appointment for an exam or a complimentary consultation.